My Name is Chien: Playing with Hair Chalks! Colorful heads is all the rage now, bright colors of pink and blue which looks really lovely. 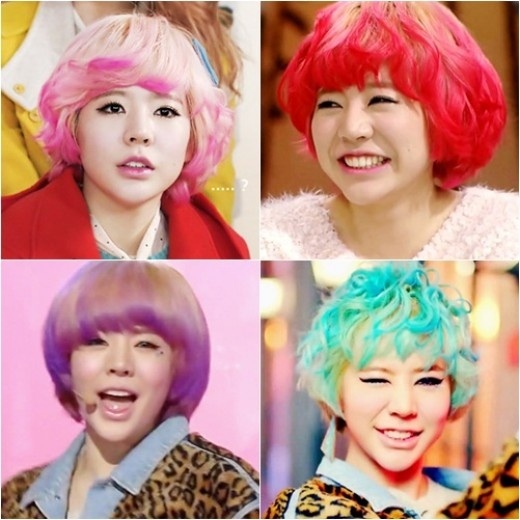 Sadly this fun colors only shows up on light colored hair, in SNSD's Sunny's part: blonde. Besides hair dyes, there are hair sprays for temporary hair color. I have not tried any colored hair sprays yet but it sure does show up on black hair based on what I've seen. Some of the brands my friends used were from HBC and Watsons. I just discovered this lately, a temporary color with a fascinating usage process: hair chalks. A hair chalk, from it's name itself is basically a colored chalk intended for hair coloring. The texture is like soft color pastels (the ones used for school projects!) I have seen other girls in youtube use the color pastels from bookstores so I guess it's fine to use the same too. However the ones sold in multiply and facebook are obviously bigger in size so I guess it is cheaper. What amazes me is the fact that hair chalks, just like hair sprays is working on dark colored hair! On my situation, my hair is black. Another thing to love is the fact that the color is temporary, which means you don't have to always show off rainbow hair when not needed, especially on the streets of Metro Manila *wink*. Wear dark colored shirt or of the same shade -the hair chalk you'll be using can transfer to your shirt. Choose the part of your hair you would like to color. This can be the ends of your hair or different hair sections. Spray water to the hair, do this part by part to avoid instances of drying the hair even before you can color them with hair chalk. Comb the chalked hair before it dries. Some chalk might also come-off when you comb and your hair will look messy and dry but don't freak out, it's normal. Use hair iron to style your newly chalked hair. They say this is a process to seal in the color -not true for me, but your hair will look more polished this way. Temporary way to add fun colors to hair. Cheap but effective hair color on black or dark-colored hair -Awesome! Process of coloring takes short period of time once you get the hang of it. Messy, chalk can fly anywhere once fully dried and color can transfer on shirts. Drying on hair so make sure to use conditioner afterwards. Not recommended as full head hair color, tried it once on my sister and she said it was not comfortable, use hair sprays instead. Online Shops in Facebook, Multiply and Ebay, you can also try colored pastels from bookstores.